Happy Wednesday! One of my favorite trends right now is using neon accessories which is why when I'm out shopping I jump up and down with joy when I see cute neon accessories. I love pairing a neon accessory with neutral tones (as can be seen here and here) and have it be a pop of color or accent to an outfit. In my search for more neon accessories online I realized that 1) there are more options out there now they are more popular 2) there are very inexpensive pieces out there! Which is why today I'm going to do a post that is a little bit different than my usual, I decided to do a "round up" post of some of the favorite neon pieces all bellow $20 that you can find online :) I hope you like it! Feliz miércoles! Una de mis tendencias favoritas ahorita es el uso de accesorios neón y por eso cuando estoy de compras salto de alegría cuando veo accesorios de neón bonitos. Me gusta ponermelos con colores neutrales (como se puede ver aquí y aquí) y hacer que sea un toque de color o el acento de un look. En mi búsqueda de accesorios de neón online me di cuenta de que: 1) hay más opciones por que ahora son más populares 2) hay piezas muy baratas por ahí! Es por eso que hoyhice este post que es un poco diferente de mi costumbre, decidí hacer un conjunto de algunas de las piezas de neón que cuestan menos de $20 online! Espero que les guste! wow these neons are great! great post! My fav is the filigree bracelet! OH yes...neon brights are all the range this Spring. I'm thinking that the accessories are the way to go because some neons on me just make my yellow undertones more obvious. I am seriously loving all the neon accessories I see, but I always have a hard time thinking of how to pair it with my clothes! Cannot believe that neon bag is from Old Navy... running their IMMEDIATELY. great picks. Neon accessories are absolutely amazing! There's a new post up on my blog, so feel free to stop by! Cool neon picks and I love that they're all under $20! Thanks for stopping by my blog :) Following you now! the neon accessories are so cute! You gave some great options and I lvoed your last outfit post. My faves are options are 7-14 I will start looking for neon accesories now. These are so pretty! I adore the neon trend! This is awesome because I love Forever21, they're so affordable, and it's nice to see that there's trendy jewelry for such a good price :) Yay! love neon! i actually just got that f21 necklace a few weeks ago! 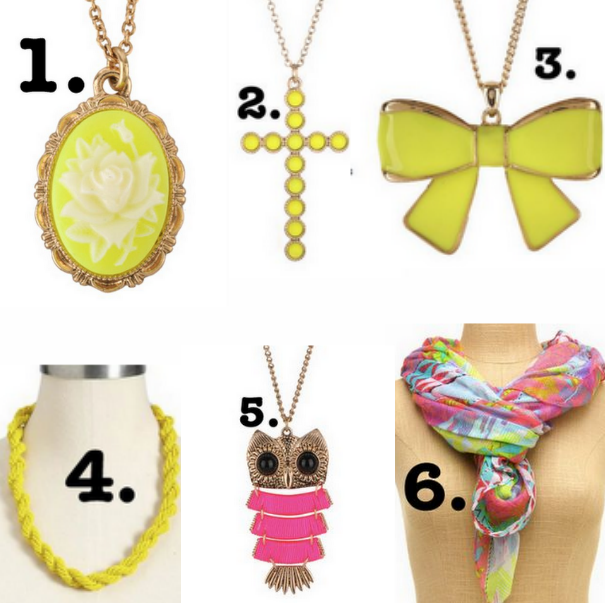 Love the neon colored accessories and love the prices even more! Great post Paulina! :) I am in love with neon lately, so i will def check this out!! thanks for putting it together in such a cute collage!! 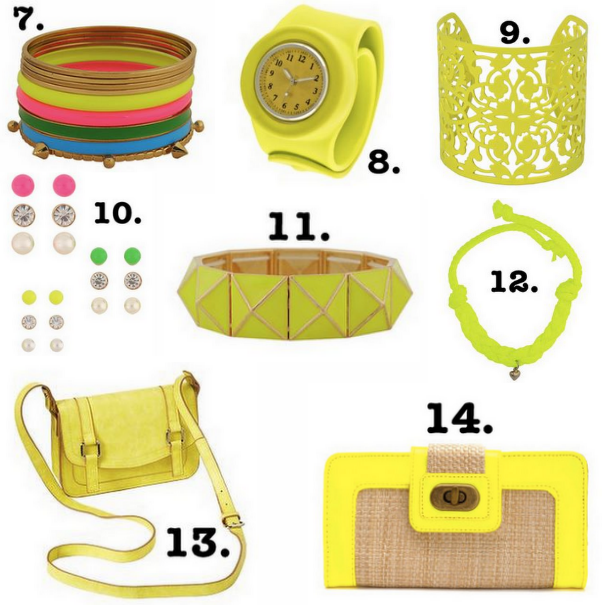 those neon bangles are my fave, I love how neon is making a comeback in the spring once again! I adore owls and neon! Great selection and such a lovely layout you have for your blog! I was wondering if you'd like to check my blog and/or follow. If you do so, please let me know so I can also follow you on Google Friend Connect. I love anything in neon! Great neon choices and for under $20...they're definitely a deal.